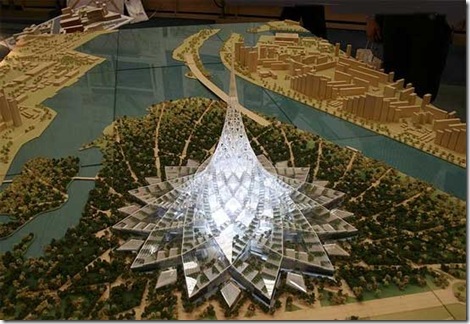 This is not a concept design for an upcoming SF picture, it is the mockup for a new building to be constructed in Moscow. The $4 billion "city in a building" will cover a whopping 2.5 million square meters of floor space... There'll be hotels, apartments, museums, cinemas, and more, with enough space to house 30,000 residents. In fact, it'll have 3000 hotel rooms, 900 serviced apartments, offices and shops, and an international school for 500 pupils (DVICE). While the design is gorgeous, the upkeep on the facility will dictate whether or not Crystal Island becomes a tourist attraction. With this many windows, I cannot imagine how many people it will take to keep it clean. I would also love to see it illuminated by night as the lights alternate through the spectrum. This could be really beautiful.